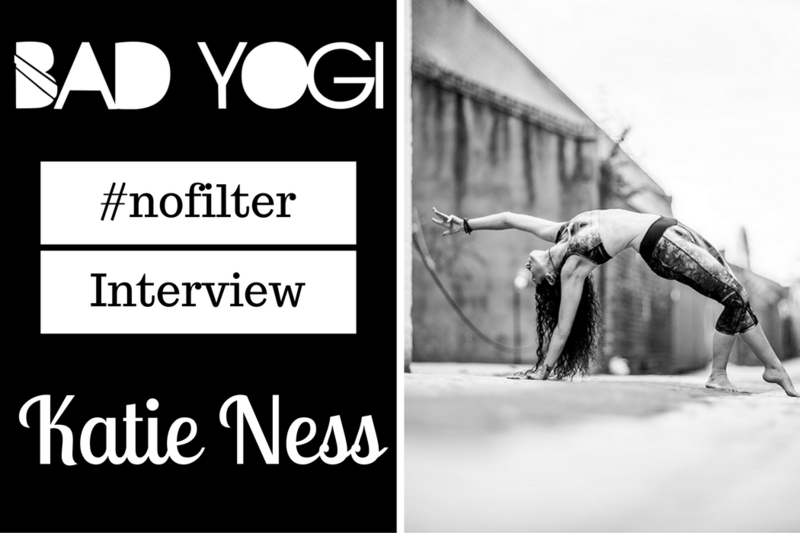 I am over the moon and super excited to introduce the Bad Yogi Community to Sarah Jane Hinder! A few months ago I was searching for a nice yoga book to read. I came across a vibrant children’s book by Author Mariam Gates titled “Good Night Yoga”. Beautifully illustrated by Sarah Jane Hinder, this children’s book is a pose by pose bedtime story where parents and their children can practice yoga. Over the past few months I’ve had the pleasure of getting to know more about her journey. She’s extremely talented, super kind and to my surprise, said yes to this interview and took time out of her day in Manchester, England to answer a few questions. I’ll stop here as I’m starting to sound like a book illustrator groupie…LOL! Briefly tell us who you are and “what you do” in 3 sentences or less. 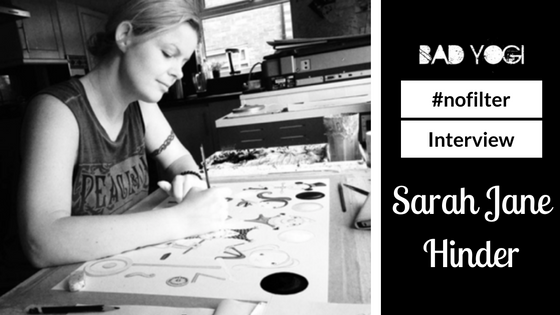 Hi I’m Sarah Jane Hinder and I’m a children’s book illustrator and an adult and children’s yoga and mindfulness teacher. Whats the best and worst thing about your work? The best thing about being an illustrator is being able to do what you love as a job… in fact it doesn’t feel like work unless a deadline is looming. Waiting for the next job to come is one of the hardest things about being an illustrator. That’s when doubts can set in and comparing yourself to others. My other job as a yoga teacher is very new and I just love it. It gets me out of my little bubble and into the real world and meeting people. Being able to share my passion for yoga and know that I am helping others is the best part of being a yoga teacher. Worst part of being a yoga teacher is very similar to my illustration job… Comparing myself to others can lead to self doubt. However I’m really using my own practice to help work on these insecurities. Children and animals are my biggest inspiration. We can learn a lot from them. Children are inquisitive learners and always wanting to explore new ideas or places or challenge themselves to get better at things. I think as adults we tend to fear the unknown and fear what people may think and hold back from things we may want to do in life because we should act and look in a certain way. I do believe we should all try to keep young minded and learning try new things. Animals definitely inspire me to draw and I love the fact that they live in the present moment and are fiercely loyal. Plus they don’t care how you look. My chihuahuas, Paul and Alice, love me with scruffy hair and in my pajamas. They love what’s on the inside. Yoga definitely inspires me to be a better person and to also learn to love myself. It has also allowed me to understand my own body and mind and although it’s an ongoing process it’s something to work on every day. There are so many amazing artists, writers, philosophers and yoga teachers that inspire me, I cannot single one or two out. The ability to create and to work hard to achieve any goal inspires me. What’s your personal measure of success? To hold a book that I illustrated in my hands is amazing. It’s a dream come true. The icing on the cake is to see photos/videos of children reading or interacting with my books and enjoying my drawings is my measure of success. I try to keep a copy of all photographs and reviews that I find. I intend to make my own little visual scrapbook as a lovely record of my success. If I can make someone smile then I have succeeded. The ability to draw and paint are definitely my greatest assets. I have drawn ever since I was able to hold a crayon. When I’m drawing I truly feel content and happy. I completely understand the ever-growing popularity of mindfulness coloring books as I know that I am totally in the present moment. As a child I was painfully shy but being creative gave me the opportunity to feel confidence. I would definitely say it’s my mind that can hinder me. Self doubt and fear can cause so many problems. I’ve always been a perfectionist but it becomes a pressure that can impact on every aspect of my life. The fear of failing and comparison to others is such a negative thought process that I continuously work on daily. It can be all consuming and in turn self fulfilling. Productivity and creativity is affected. I find that lighting some incense and getting onto my mat and just grounding and letting go of insecurities through my yoga practice really helps and after I feel much more positive and filled with creative energy. Which is true about you: usually you follow your heart, or usually you follow your logic? Definitely follow my heart. I don’t think wearing your heart on your sleeve is a bad thing however I do believe other people can see this as a weakness or can take advantage. But I would never change this about myself. How has yoga helped you in your daily and work life? Yoga is like my positive energy reset button. I feel amazing during and afterwards. I put whatever is going on in my life on pause and just enjoy being on the mat. And of course at times the frustrations can pop in when I want to do a forearm balance (still working on this) but I have to remember that it’s the process not the result that’s important. But my ego really wants to do these superstar poses ha ha! If there was absolutely NO way for you to make any living doing what you do now, what else would you do? I would love to work with animals… maybe helping against cruelty to animals. Not sure exactly what I would do but I would love to be have an animal sanctuary. Maybe one day. Sometimes following your dream can be difficult financially. What advice do you have for people who want to stick to their goals and their dream but still have to pay the bills? I have had a few years struggling financially. I left a full time job as a high school teacher of art and design and embraced the fact that it was going to be a challenge and had to prioritize what I spent my money on. I was lucky that I had my husband to support me emotionally as there were times I nearly quit. But it was a real struggle. There were times when no work was coming in or if clients weren’t paying me on time, my payments were then late. It was a really difficult time but all I can say is working hard and remaining determined and as positive as you can be in times of stress is the best piece of advice. Don’t let the pressure engulf your creativity and your passion. consider. Sometimes you have to sacrifice that new pair of yoga pants or haircut but it’s worth it to be able to do what you love. Alright, just for fun: If you could travel anywhere in the world to practice yoga where would you go and what one yoga prop would you take? Well I’ve just been to Rome and I did a sneaky tree pose in the Roman Forum on Palatine Hill. I wanted to do a crow or a dancer pose in the Vatican but I felt a little shy ha ha. I think I’d love to practice yoga in Tibet in front of one of their amazing statues or lakes. I would have to bring my yoga mat. I know it’s the most obvious prop but it would be a reminder of my visit and practice once I got home. How do you come up with the most adorable characters for the Good Night/Good Morning yoga books? 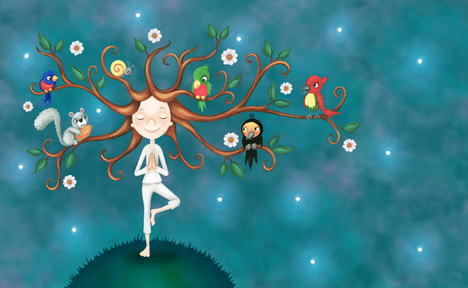 I adore creating cute little characters and I decided as soon as Mariam asked me to do a tree pose that I wanted the girl to become a tree. I like being as imaginative as I can but often art directors/ publishers will say that’s great but we just want the girl in tree pose… can we lose the hair being branches. Mariam loved it and then approached Sounds True and the only edits to that illustration were to move a few leaves/flowers. I was over the moon. 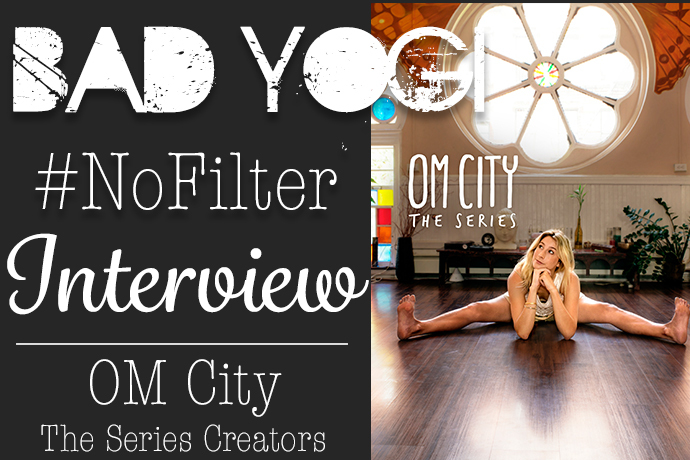 I definitely know that my experience practicing yoga has helped me create these characters. I don’t just copy photographs of poses… I feel the poses too. Life drawing and studying anatomy also helps. Often my little characters reflect children I know. In fact in Good Night Yoga there are many of my friends and family’s kids in there and Mariam’s too. 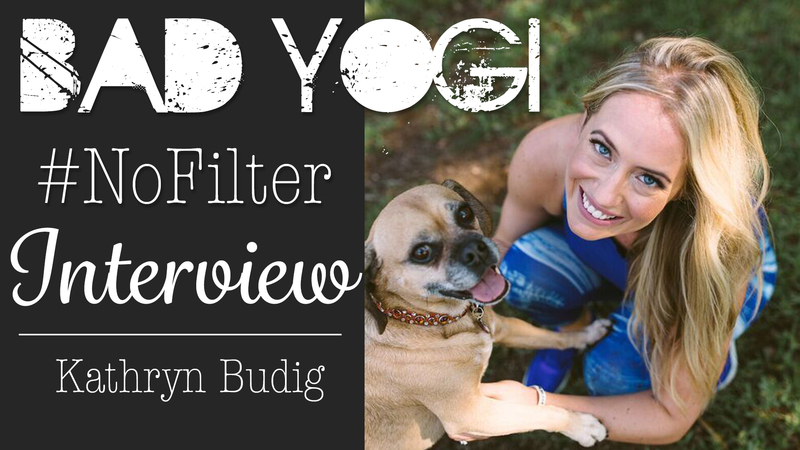 Anything else you’d like to say to or share with the Bad Yogi Community?! Yes I’d love to share with you my amazing news that I am creating a set of board books for toddlers and children with Sounds True that I have written and illustrated myself so they will be my first ever author/illustrator book. I’m so excited and feel blessed. The first one will be published in August called Yoga Bug which will feature cute bugs and children doing yoga poses like Ladybug and Spider and at the back will be a little yoga flow like Good Night Yoga and Good Morning Yoga. I hope they become a must book for every yogi parent’s home. Crossing my fingers and toes! 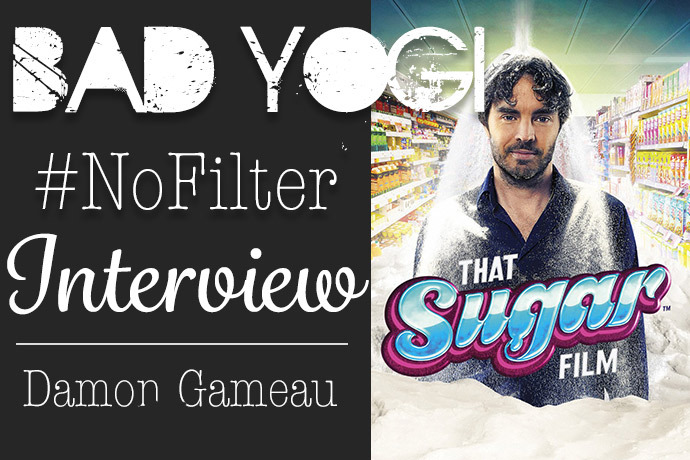 And thank you so much for asking me to do this interview for Bad Yogi. 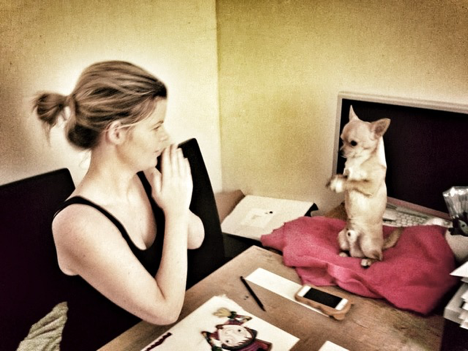 I absolutely love Erin’s style and often do her yoga challenges. Wonderful interview! Enjoyed the featured interviewee’s raw vulnerability and her suggestion that one accepts the hard ‘pockets’ preceding and during the bliss. Love the idea of living in the ‘zone’, that space that one only finds when one’s work is also one’s love. Thank you for bringing us this exchange, Cheryl! Looking forward to the toddler board books! Sarah is a beautiful soul and gifted illustrator. While perusing her portfolio, her work connected to my heart. I felt love and tenderness from her illustrations and asked her to illustrate my first children’s book and children’s yoga album. Thank you, Sarah, for shining your loving heart in the world. Thank you, Cheryl, for highlighting this talented woman who cares so much about putting love, tenderness and joy into our children’s lives. 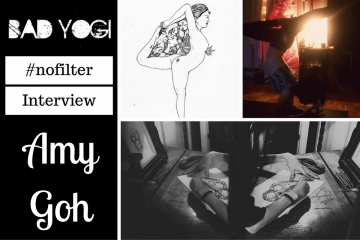 Hi, I’m Cheryl Kricket - Bad Yogi Ambassador and curious yogi. I currently travel throughout Tampa, Florida exploring different yoga studios, and I also enjoy Brian Yoga! Brian Yoga is pretty much reading all things yoga. 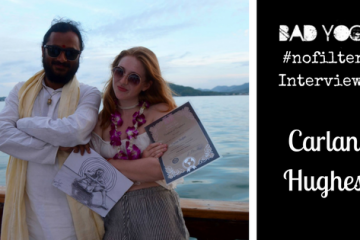 I’m a Certified Yoga Teacher and Life Long Yoga Student.